We are proud to announce the launch of our brand new educational resources, created in partnership with NHS Blood and Transplant. 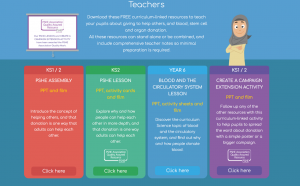 The free, curriculum-linked resources will empower children and teachers in primary schools across the UK to understand why and how people give to help others, with blood, stem cell and bone marrow donations. The resources include a Science lesson and Personal Social Health and Economics (PSHE) lessons, all of which can be downloaded from our newly designed ‘Giving to help others’ website. Each of our new PSHE lesson resources has been rigorously assessed by the PSHE Association and awarded their Quality Mark, which assures teachers that they meet the ten principles of effective PSHE education. The addition of these new classroom lesson plans and activities on ‘Giving to help others’ will create a more comprehensive offer for primary schools. Now they can learn about donation through a whole-school assembly, in a science lesson, in a PSHE lesson or even through a comprehension task in English! The resources are also flexible – if teachers aren’t able to dedicate a whole lesson to the topic, our new video on blood donation can be shared with the class, or school, in under five minutes. With that in mind, we have included a campaigning element in our resources, so pupils themselves can ‘Create a Campaign’ to spread the word about the power of donation. With these kinds of resources, we really hope to create a shift in how the next generation views donation. Please help support our mission by sharing the resources with anyone you know in primary education. Equally, if you have ideas, contacts and influence that might help to spread the message to more schools and teachers, we would love to hear from you. « Episode 3 – Our boat is wrapped !